The Lishi 2-in-1 Pick and Decoder is the end product of over 2 years development work. These superb tools will pick and decode the lock for you in under 3 minutes. Lock picking is made faster than conventional Lishi Pick due to the revolutionary business end of the tools. Locksmith Tool and Lishi Decoders supplier. 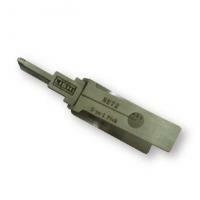 * we provide Locksmith Tool and Lishi Decoders supplier. and auto key and auto key programmer in china.